With over 30,000 named diseases and the list growing yearly it has become apparent that the real answer to these disease processes is to support the foundational functions which create health. By supporting these foundational pillars of health, we also promote correction of the abnormal processes which result in disease. Using the 7 pillar approach to foundational health, over the past 29 years with over 32,000 different people, has shown us that the body is capable of correcting virtually all of the misalignments from healthy function which humans experience. During your care here, the 7 pillars of foundational health will be addressed and balanced as well as possible, while also addressing the specific complaint that may have compelled you to seek care. Most people vastly underestimate the body’s ability to successfully achieve change and improvement because they have only tried fighting symptoms and disease while ignoring the underlying functions. Your body is amazing creation, if you up-regulate your physiology, you will heal physically, mentally, and spiritually. We base our success upon working with the wisdom of the body (the innate intelligence) and supporting each of following 7 pillars of health and healing. The nutrition program in my practice is a nine-month process, which I guide you through. Once a month, I will supporting each one of these pillars, significantly increase your body’s health. At this point we move you to maintenance, which is once every 3 to 6 months depending on your health. 1. Endocrine/Neural-Hormonal Health – The endocrine/nerve system is the most powerful control system of the body. This system must be balanced in order to activate the body’s other powerful systems of repair and healing. Most people lead challenging lives complicated by hormonal disruption and glandular depression. Gradually we will detoxify the hormone disrupters that interfere and block normal hormone activation, while also strengthening and repairing the seven levels of glands that comprise the endocrine-neural system. 2. Glycemic Management – The ability of the body to properly control blood sugar and thus regulate insulin and cortisol levels is essential to reducing stress and promoting longevity. The largest stress on your body is hypoglycemia (low blood sugar). Balancing your blood sugar will regulate your insulin and cortisol response. To create an active healthy long life, we will seek to limit the typical insulin spikes and elevation of cortisol which lead to premature aging, and complex secondary symptoms such as diabetes, heart disease and cancer. 3. Bioterrain (mineral) Status – This system principally concerns itself with the body’s ability to neutralize the net acid excess that builds up in normal life. When we become too acidic we experience increased inflammation, irritability and emotional intensity. The most powerful effect over this acidity excess is accomplished through the alkalizing effects of certain food and minerals, especially Calcium, Magnesium, and Potassium. 4a. Inflammatory Status – As we age, our inflammatory levels increase due to the cumulative repair deficit occurring in our lifestyles. Indeed many believe that an elevated inflammatory level is the entry level doorway to almost all degenerative diseases. Inflammation is powerfully affected by allergens, which act as engines that up-regulate our inflammatory mechanisms. We have identified four CORE food allergens that act as these allergy engines. Identification and removal of your core inflammatory engine(s) will greatly reduce inflammation and address the repair deficit. 4b. Immune Burdens –Many people experience incomplete immune processes. Physiology-interrupting drugs are also highly used. These incomplete immune processes lead to low grade infections, fungus, toxicity and infestations of parasites. This creates a low grade subclinical burden (symptoms may be subtle). Even though we may be unaware of these burdens, they nonetheless exhaust immune functions running down the bone marrow and leaving the body vulnerable to other more lethal issues. 5. Circulatory Status – Recently understanding has expanded to see that loss of circulation can cause tissue weakness and even death (necrosis) resulting in the onset of a complexity of diseases. Our experience has shown us we can use natural remedies to successfully reverse circulatory blockages and bring renewal and healing to the oxygen/nutrient starved tissues which are distal to the blockages. A healthy circulatory system is key aspect to creating an active healthy long life. 6. Digestion – Every living system (from cell to organ, to body, to community) must have two fundamental capabilities – to bring in substances that provide energy and sustenance, and to remove wastes. The integrity and strength of your gut wall lining will determine your ability to distinguish the difference between what needs to be absorbed and what needs to be eliminated. Many people have a “leaky gut” which allows undigested food particles to pass into their bloodstream, creating an immune/inflammatory burden. By strengthening your gut lining we will improve your ability to absorb fully digested healthy nutrients, and assist your body in proper elimination of toxins. 7. 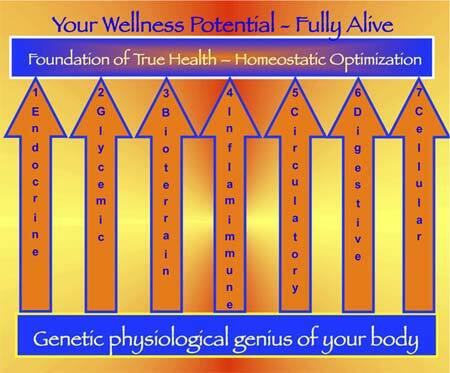 Cellular Vitality – Promoting cellular functions is the most upstream intervention in health care. We can literally predict disease cascades and define someone’s resilience by their cellular function. We understand pathways that were previously unknown, and how to up-regulate them can change our probable predictable future. Working on cellular vitality can help us live longer and healthier. The new term for these cellular enhancing approaches is cytoprotective. We have now discovered that there are genes dedicated to our survival. We can up-regulate these genes with herbs and nutrients from our plants, which can help us literally live longer and healthier. For many health and disease are mysteries that make them uneasy about the stability of life. This is only because they have never understood how our body was designed to maintain itself. If we are healthy it is because we have employed the laws which create healthy functioning of the body, which include each of the above 7 pillars. If disease occurs it is always because the foundations that maintain health have been compromised. It is good to stop living in terror with the mystery of who gets sick and why others don’t. Health has a cause!